This week we go back to August, 2012 for a special episode of the show that, in reality, takes us all the way back to December, 1989. 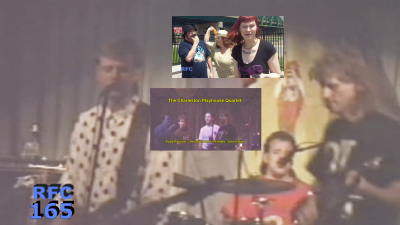 At the time I called it “my most self-indulgent episode of Radio Free Charleston.” “Wild Adventure Shirt” broke our usual format and used a skit to set up vintage footage of a 1989 concert at the legendary and defunct Charleston Playhouse by the band Clownhole. Clownhole was a punk trio consisting of drummer Randy Brown, bassist Chris (Flair) Canfield, and Defectors veteran John (Sham Voodoo) Estep. This concert was held during the Christmas season in 1989 and fell into my lap when Randy got in touch with me and put a copy of it in my hands. This was pure nostalgic glee for me. The Charleston Playhouse, which I’ve written about here in PopCult almost since day one, was a very important place in my life. I met many lifelong friends there and even met the love of my life, “Mrs. PopCulteer,” Melanie Larch, about two weeks after this concert took place. This episode of the show was a blast, and was made even more fun by the silly improvised host segments featuring me, Mel and my imaginary daughter, Kitty Killton. You can read more about this episode at the original production notes HERE. As a bonus, the night before this episode went live, I posted a NSFW preview using footage that we left out of this show. You can see Johnny Mac and Sham Voodoo hamming it up on stage below.